With primary season upon us, investor attention is beginning to turn to the upcoming U.S. presidential election. As I write in my new Market Perspectives paper, several factors make the outcome especially difficult to predict. 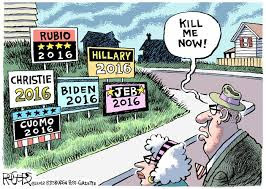 The Republican presidential nomination race is wide open, with no clear front-runner and many voters who remain undecided. The turnout for the presidential election will also impact the outcome for “down ballot” races in the House of Representatives and Senate. While the House is likely to remain in Republican control, control of the Senate could be in play, given the greater number of seats that the Republicans need to defend. For investors, the key question is, will any of this make a difference for markets? My take: The outcome of the election will matter, although perhaps not in the way many anticipate. Before focusing on why the election outcome will matter, it’s worth dispelling a few myths, namely that both the party that occupies the White House and the composition of government have a real impact on U.S. equity market returns. Starting with the party affiliation of the president: Whether a Republican or Democrat occupies the White House has historically had no statistically significant impact on U.S. equity market returns. Once you adjust for the normal variation in stock market returns over 114 years of Dow Industrials annual price returns, there’s no difference between Republican and Democratic administrations from a stock market perspective, according to a BlackRock analysis using data accessible via Bloomberg. This arguably reflects several factors, including the vagaries of the economic cycle and the importance of factors beyond the president’s control, notably interest rates, on markets. Similarly, the myth that markets do better under a divided government, an urban legend that seems to have its genesis in the extraordinary equity market performance of the late 1990s, doesn’t survive close inspection. Over the past 114 years of Dow Industrials returns, U.S. equity markets have actually performed better when government has been united rather than divided, although this difference isn’t statistically significant, according to the same BlackRock analysis. In retrospect, the stellar performance of stocks in the 1990s can be attributed to a booming economy and a secular decline in inflation and interest rates, not divided government. However, while the political identity or composition of government may not be particularly relevant for the broader U.S. equity markets, investors aren’t wrong to focus on the election. Elections do have consequences for markets and investors, since the direction of policy will be fundamentally affected by the voters’ choices. Although certain initiatives, such as corporate tax reform, are likely regardless of the next administration, other policy priorities are very much path dependent on whom is elected. Where the outcome is likely to matter is in areas such as individual tax reform, trade, health care, environmental policy, financial regulation and the Federal Reserve (Fed). While none of these policies are likely to be a major driver of the broader market, they will have a significant impact on certain segments, such as utilities, energy companies, financial services and health care providers. In my opinion, under a Republican administration, which is likely to coincide with a Republican Congress, individual tax relief and support for trade deals are more likely. Should the Democrats win, presumably under Hillary Clinton, I believe corporate tax reform is still likely. However, individual tax reform, while still possible, would arguably involve a more complex “grand bargain” tied to corporate relief, particularly as the House and potentially the Senate would remain in Republican hands. At the same time, a Clinton administration would likely be willing and able to embrace immigration reform and make modest adjustments to the Affordable Care Act (ACA). Another area where I believe the outcome will matter is with regards to the Fed. A Republican administration is likely to result in a Fed whose members are more sympathetic to a marginally more systematic approach to monetary policy. The election will also have an important impact on the leadership at key financial regulatory agencies, especially the U.S. Securities and Exchange Commission (SEC) and the U.S. Commodity Futures Trading Commission (CFTC), along with the Department of Labor, which is increasingly active in regulating retirement products. Unfortunately, perhaps the most important issue for interest rates and the dollar is likely to remain untouched regardless of who wins: Thus far in the current campaign, neither party is demonstrating much appetite for long-term entitlement reform and related deficit reduction. This is hardly surprising. The deficit has been declining, the Fed has kept short-term rates low (keeping government interest payments low in the process) and U.S. Treasuries look attractive relative to the competition. Obvious catalysts for fiscal reform are absent. And in the absence of a catalyst, history suggests policy makers will wait until the pain becomes more acute and poses real political risk. Meaningful reform is dependent on political consensus and some pressure from the bond market in the form of rising rates. For now, both are likely to remain in short supply,whatever the outcome of the 2016 election. Russ Koesterich, CFA, is the Chief Investment Strategist for BlackRock. He is a regular contributor to The BlackRock Blog. This material is not intended to be relied upon as a forecast, research or investment advice, and is not a recommendation, offer or solicitation to buy or sell any securities or to adopt any investment strategy. The opinions expressed are as of January 2016 and may change as subsequent conditions vary. The information and opinions contained in this post are derived from proprietary and nonproprietary sources deemed by BlackRock to be reliable, are not necessarily all-inclusive and are not guaranteed as to accuracy. As such, no warranty of accuracy or reliability is given and no responsibility arising in any other way for errors and omissions (including responsibility to any person by reason of negligence) is accepted by BlackRock, its officers, employees or agents. This post may contain “forward-looking” information that is not purely historical in nature. Such information may include, among other things, projections and forecasts. There is no guarantee that any forecasts made will come to pass. Reliance upon information in this post is at the sole discretion of the reader. ©2016 BlackRock, Inc. All rights reserved. iSHARES andBLACKROCK are registered trademarks of BlackRock, Inc., or its subsidiaries. All other marks are the property of their respective owners.